Your Facebook page’s organic reach is about to plummet — even more so than it has in the past six months, down to a lowly 1-2%, actually. That means if you have 1,000 Facebook likes on your page, only about 10-20 of those fans will even see your posts! 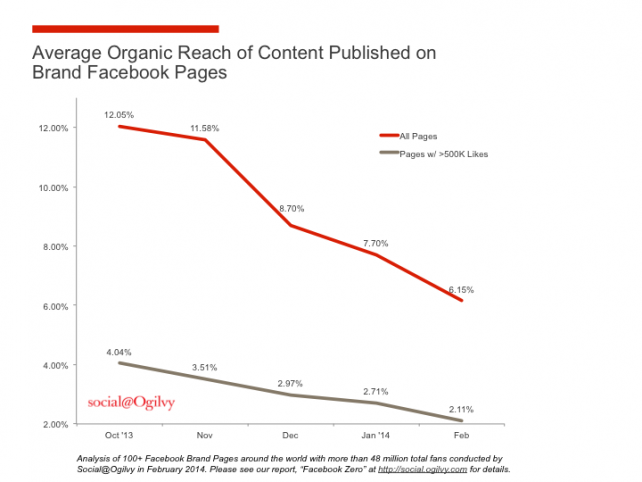 While organic reach has long been declining, it has significantly declined since the fall of 2013. Imagine that you are Facebook in 2008. You have created a massive media ecosystem where people can talk to each other, share news, pictures, stories, blog posts, etc. What an idea, right? “Engagement” becomes the name of the game. Communities start growing around ideas, topics, even products and brands. At first, the ones with the most true, organic engagement are the fastest to grow and gain traction. What a cool concept. As more and more people start to spend time on the platform and your targeting engine gets better, advertising becomes a solid revenue model. So far so good. But then brands start getting lazy. Instead of interacting with their fans (oops, sorry… “likes,”) they start handing off their Facebook pages to digital agencies. “Content is king” starts to replace actual engagement. The exercise becomes this: have your agency craft content for Facebook, publish it, measure likes and click-throughs, repeat. Before long, those branded Facebook pages stop being about engagement and conversations. They just become a push-only marketing channel. That brings us to 2014. Like I said before, if you treat earned media like paid media long enough, you will teach it to act like paid media. Brands and their agencies did exactly that. Looking at it from a media buyer’s angle, it was a lot like having your own free dedicated page in a huge digital magazine with a billion subscribers. Brands paid agencies to produce “social content” (advertising that looks like Facebook updates) but the media space was free. How long did anyone expect that to last? We can’t blame Facebook for meeting brands and their agencies the rest of the way. If you’re a big brand, this won’t have any impact whatsoever on their “Facebook Marketing” strategy. Okay, sure, it will cost a little more now. So what? Not a big deal. Cost of doing business. Small businesses though? Very different story. This move could be catastrophic for a lot of small and medium-sized businesses that had spent the last few years building (earning) communities on Facebook, and that needs to be addressed. Not just that, but the new reach model is also screwing up user experience on Facebook to the point where what they want to see in their feed is being throttled back. So while Facebook’s reaction is normal and perfectly rational, it is causing two unintended problems we need to address: preserving small business organic reach, and giving users more control over their Facebook experience (not just privacy settings). 1. Give users some kind of dashboard that gives them more control over what appears in their feed, especially in regards to the people they follow. A lot of what users want to see in their feed is currently hidden by Facebook, and a pretty big chunk of what does appear in their feed is hours (and sometimes days) old. Give users a way of customizing their feeds. You can still inject it with sponsored content, Zuck. Just let us manage the rest of it ourselves. 2. Give users the ability to opt in to continue seeing content from brand pages they want to stay engaged with. For instance, I’m a fan of Carolina Triathlon, O-Cha Tea Bar, and Imperial Black. All three are relatively small businesses. They aren’t major advertisers with hundreds of millions of dollars of advertising money to throw at digital channels every year. I want to see their updates in my feed though. I am an active part of their community and they are active parts of mine. (That was the idea when I clicked that Like button in the first place.) Give me the ability to see their content. It matters to me and they’ve earned that attention. I understand that these two options might seem at odds with Facebook’s new paid media model, but hear me out: think of this as a means to reward good community management behavior while still monetizing on purely by-proxy advertising behavior. Business and brand pages that only (or mostly) just broadcast can still pay for the reach, for those sponsored and promoted posts. But business and brand pages that make the effort to respond and mingle with fans, especially if they aren’t massive companies like McDonald’s or Pepsi, can catch a break. Set some parameters. Set some thresholds. Don’t treat a local restaurant that does its own community management on social channels the way you treat a global brand that has five digital agencies posting crap content twice a day like some kind of social channel robot. It wouldn’t be very difficult to make that work. Give small businesses a break, at least. Let their true fans opt in to their content again. It will make the ecosystem work a lot better and everyone still gets what they want. Footnote (3/28/14) – As an added consideration, here is an astute observation made yesterday by Jillian Paige Jackson during a discussion about this: “This move has sort of rendered page likes obsolete, in that if you’re paying for views now no matter what, then you don’t need to depend on having your fan base there to propagate your posts organically.” That’s right. In an ecosystem were likes (being a fan, “opting in” to a feed) no longer has any real impact on reach, what is the value of a “like” on Facebook, moving forward? Zero. At best, it’s an endorsement. Does this signal the end of the “like” as a relevant social media metric (and for far too many businesses, the key Facebook metric)? Based on what we are seeing with the impending end of organic reach for business/brand pages, yes. Unless Facebook does something about it, acquiring “likes” is about to become as futile an exercise as giving away koozies at a trade show. B2B Industrial manufacturers, late bloomers in social media for the most part, are another group hit hard by this new model. With technical products and small narrow target audiences to start, I suggest they not get caught up in the FaceBook frenzy in the first place. Stick with LinkedIn and develop a helpful blog. Your entry point in Facebook otherwise will likely mean pay to get likes + pay to play. Even the big boys won’t like the marketing spend there. Absolutely. I hope that Facebook realizes the problem and addresses it properly. Also, the model they are considering doesn’t scale particularly well. Imagine what would happen if every brand page paid to have their promoted posts hit their audience’s feeds. What would that look like? It’s untenable. Facebook is going to have to figure this out and fast. Enjoyed your comments, thank you. Verrry thought-provoking. I have a question, though. In the comment you made regarding Jillian Jackson’s observations, you write: “likes (being a fan, “opting in” to a feed) no longer has any real impact on reach.” What about the situation where you target Facebook ads to those who have ‘liked’ your page? Isn’t it still valuable to keep acquiring ‘likes’ so that you have those specific people who have liked your product/service? Yes, paying for something that used to be free, but still, something of value? That would be a way to make likes work, absolutely. Ideally, you would have to start being more tactical about your content to make that work. Some of it would focus on discovery and fan acquisition (targeted at accounts that don’t already like you, and some would be about fan (hopefully customer) development and retention (targeted at accounts that have liked you). Completely different types of content driving very different types of outcomes. But yep, you’re right. Still valuable. Facebook is proving a Catch-22. Almost everyone is there, but almost everyone is sharing almost everything, and you realistically get almost NONE of the stuff you might truly care about. At least, not in any kind of timely fashion. Add the latest craze of ViralBlather sites barfing up the best Reddit had to offer last week and enough incendiary, bi-partisan politicking to make you consider a lovely hermitage in the Canadian Rockies, and you have a pretty strong case for walking away. Which raises nearly the same questions. I recall Luis Suarez’s relatively recent comments on how even the G+ feeds weren’t showing everything from everyone, and how difficult it could be to tweak and modify your circles in an effort to do so. What are we going to do, then? My old standby has always been to focus on my own site, keeping simple outposts elsewhere, and maybe there’s merit to ditching brand pages/profile in favor of simply sharing on one’s personal account? I dunno. Just an interesting topic. The structure depends a lot on what you’re trying to do too. Are you pushing? Are you pulling? Are you just a sharer? Are you a conversation catalyst? A maven? A content explorer? I wonder if coming up with account categories (sort of like character classes in gaming) would help create manageable curation models for users. It would certainly keep them occupied, playing with all the different permutations. The irony of this blog post — which I agree, btw, Olivier — is I launched a new page of mine this week. I wait to see how many boosted posts I do. Page likes are very relevant. It gives a brand a list of who wants to interact with them. Superb article, Oliver. It shows quite strikingly that we’re back to what Seth Godin would call the ‘advertising industrial complex’ and the original concept, and potential, of Facebook as a social network has been largely lost. This is in some way no surprise as hockey stick growth left little room for the marketing ecosystem and its business model to adjust. Now the old communications parameters have been largely reinstalled and retro-fitted. As a person who cut their teeth in advertising a couple of decades ago and saw the limitations of it and then the potential of social media, speaking personally, I find this nothing short of tragic. Consumption is a passive activity and expensive to pump-prime. How do you think we can get back to encouraging contribution, dialogue and two-way engagement? The web is diminished without it and businesses having to pay to play on social networks will be a real handicap to innovation. Thank you! And yes, a lot of folks underestimated the advertising industry’s ability to turn the tables on social, but here we are. Advertising isn’t dead. It’s winning. Puzzled by this post. Of course this was Facebook’s ‘plan’. The only surprising thing is how elements of the marketing industry still take Facebook seriously in the face of the crushing indifference of people wanting to keep up with their friends, sorry, participate in a “media ecosystem”. We’ve all seen the poor quality of advertising on the platform. “Communities start growing around… brands”. Such as? If you check the ‘People Talking About’ figure for supposedly highly popular Pages most brands can barely scrape a couple of percent. Nokia – 1% – most popular city: Dhaka. Samsung – 1.2% – most popular city: Cairo. BMW – 1.1% – most popular city: Bangkok. I hardly need go on. “You don’t have to depend on your fan base…”. You should realise that if your fan base don’t want to interact with you paying to access complete strangers is going to perform even more poorly. So you’ve paid for reach. Or paid an agency to pay for reach. Now what? Facebook is a black box when it comes to information about followers. The only possibly useful advertising is that which leads users to give up some other piece of individualised information that means you can then contact them outside of Facebook’s platform. We do agree on the point about small businesses as these are often more successful due to the fact their off-line relationships with customers translate well into a social space. Yet as you say they will be screwed and can’t justify the expenditure to keep up. But that isn’t where the money is for Facebook’s shareholders. Based on recent research I conducted with 17 to 18 year old students 97% confirmed they had a Facebook account yet only 15% of them cited Facebook as their ‘favourite’ social platform. Ironically Facebook doesn’t have the social intelligence to realise how badly it has alienated the people it sells to advertisers. As a third (possibly practically unfeasible) suggestion, what about eliminating the algorithm altogether? I.e. how it used to be, and how Twitter basically still is: Every post of every person or page you are friends with or like gets equal weighting, and just shows up in your feed chronologically. I understand the attempt to prioritise “good” content based on engagement metrics, but this leads to all sorts of mess – that which is discussed here and other side-effects too.